Owl Cupcakes! For a Happy Owl-O-Ween. How are you decorating your cupcakes this Halloween? I thought about all the usual suspects: skulls, eyeballs, ghosts, witches, werewolves and mummies. And then the answer became frighteningly obvious: owls. Because nothing sends a shiver down my spine like the sound of a “HoooOOOOooooot.” Or the sight of that swivel-head. Bloodcurdling! Then I found this owl design in “Hello, Cupcake!,” and it’s as easy as a witch in a broom shop. DANGEROUSLY close to Sandra Lee territory. But it’s Halloween! Time to embrace the tacky! Now, let’s get our hoot on. Separate the Oreos. (You might want to microwave them for a few seconds first.) Use a paring knife to remove any crumbs from the cream filling. Spoon 1 cup of chocolate frosting into a Ziploc bag, press out any excess air and set aside. Spread the remaining frosting on the cupcakes. Using a little frosting, attach 2 of the large ear pieces, rounded sides in and about 1 1/2 inches apart, on top of each of the cupcakes. Angle the ears slightly away from each other, and allow them to extend about 3/4 inch beyond the edge of the cupcake. Place two cream-sided cookie halves, cream side up, on the upper half of each cupcake to make the eyes. Snip an 1/8-inch corner from the bag with the chocolate frosting. Pipe lines of frosting along the length of the cookie ears to cover. Starting with the edge at the top of the cupcake, pipe the feathers with the frosting using a squeeze-and-pull motion. Work inward from the edge in slightly overlapping rows until the section above the eyes is covered. Pipe a few feathers on the edge just below each eye. Press a yellow M&M in the middle of each cupcake to make the beak. Use a dot of frosting on the cream of each cookie to attach a brown M&M to the eyes of the cupcakes. These might be the most adorable cupcakes that I have ever seen. And I mean, anyone who follows food blogs has seen a lot of cute cupcakes. But seriously, those GIANT googly eyes? Freakin ingenious. I love them!! These are getting printed out for my binder of “things to make when my baby can appreciate it”. Ahhhh so cute and I have to agree with Tatiana..these are the cutest cupcakes I have seen all day! Oh my and oreo..who isn’t going to love these!? I made these a few weeks ago but mine look suspiciously like cats! Oh…these are the cutest things. What a HOOT. One of my nephews still loves that silly game where you put your face right up against theirs and ask them when they grew an extra eyeball. I can just see a chocolate cake with a whole row of these on top (or maybe just three…) Thank you in advance for upping my cool factor! That is such a cute idea! Definitely an original one :)! Love the owls! Glad you had fun with these. good night, those are cute! i love owls (the swivel head is really cool)! “Time to embrace the tacky” — amen to that! You SAY that they are easy to do, but somehow I just know that mine would not look like that. I’ll just have to visit yours! They are TOO FUN!! these are so fantastic! so adorable! LOL @ Sandra Lee comment. Looks like you had a “hoot” of a good time! Love your cupcakes. Thanks for baking with me this week! That’s seriously my favorite decoration so far – those owls are awesome! Very creative choice, the owl! And you made them superb! Wow… how taky turns into really looking good, in your kitchen! what a lovely idea! your owls are a hoot :) I haven’t made mine yet, but I’ll get on it soon! Owl-o-ween! OWL-o-Ween!! HAHAHAHAHA. Easily amused, I know. you know what scares me? Wind chimes. I hate wind chimes. Ominous freaking wind chimes. Especially the high pitched ones all sproadically tinkling. Gives me the shivers. Yes! You rocked the cupcakes this week! I have this book too, it is amazing. I have only tried the corn ones so far – now I want to try these, you make them look sooo good. Great job. how cute are they?! great job. hello cupcake is such a clever book! 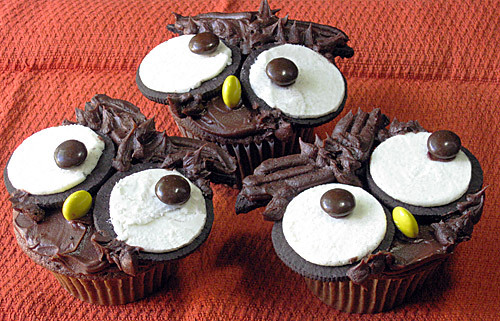 If I make it in time for tonight…I’ll do some mouse cupcakes. I’ve done them before. Of course not nearly as cute as your owls. Oops I think your Suzie Homemaker is showing! These are too cute!! I love the use of the Oreos! How clever! Who made the cutest cupcakes? Who? Who? They are really cute. Hello Cupcake is the best for no-fuss decorating. Very cute…who would not love to see these at a party? You get extra credit this week for going the extra mile…maybe two. I had to giggle…I can so see you and Sandy in the same room discussing food prep…what I would not give to see that! LOL. I do think, however, she would latch onto your cupcake idea in the time it takes to say “alls you gotta do….” (It’s a Wisconsin thing I think.) Great post, but then I expect no less…that’s why I am here each week! Love the owls! It makes me want to go try these cupcakes again to make them moist and cute. 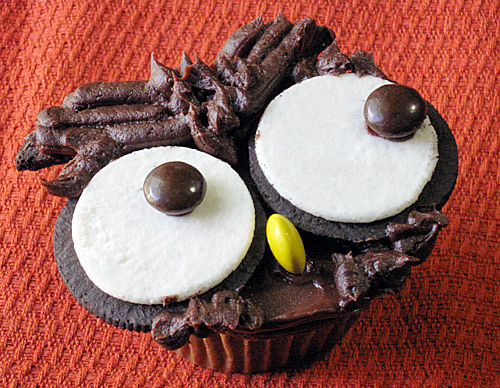 I seriously squealed with delight when your owl cupcakes appeared1 I adore owls and these are SO cute!!!! Those are so cute and look awesome! I had a good laugh at the Sandra Lee comment, too funny. Great job! I have that book as well – I have tried the pandas, but nothing else. now, I have to try the owls!! So cute! And it looks easy! Elizabeth - Cake or Death? Darling! I want to make my cupcakes all over again so I can do these. And you’re right, owls are totally creepy–at least their cupcake alter egos are much cuddlier. Those are just too cute. And I think I could even manage them since there is no elaborate piping! those are ADORABLE!! looks like soo much fun to do!! So cute!!! I may just have to try them myself. As easy as a withc in a broom shop!! LOL!! And I’m not just saying that…I really did LOL! These are so cute!! Great job. Wow, I don’t even know what to say! These are so adorable. I will definitely be trying these when I get a chance! These are just darling! I should have pulled out my copy of this book to get creative this week! My kids would have loved these. Love the owls, great creativity!! These are absolutely adorable! You are so creative! Great job on the cupcakes! I really need to check out that book–I bet my girls would get a kick out of making some cool cupcakes. These couldn’t be cuter. I also found humor in the SL comment. No shame here, my friend. And score another point for Ms. Greenspan. Aawww, those are so ADORABLE! I have that book….how come I haven’t made anything out of it? I’m such a dud. Nice photos, too. Very creative idea to use Oreo cookies as eyes. They are super adorable! Hoo Hoo Hoo gave you his cool idea?? Or was what who – dang it all sounds the same. These are so cute and really realistic – so owl-like. You are very creative. Those are so cute! Great job! OMG!! They are spectacular! I LOVE that book! Now I can see how great it can traslate its audience! Wonderful and adorable!! Ilove your site am would like to add it to my roll! oh my!!! those are ADORABLE!!!! Definately one time when I can say, “Now why didn’t I think of that? ?” OF course I probably wouldn’t – ever. These are just too much. Sandra Lee eat your heart out. I love them! I just showed them to my husband and he loved them too. They creative though really easy to do. Yum! all i can is wow! cool cupcakes..i’m sure it tastes yummy too! That does sound easy. But they look so, so adorable. And any time you’ve got Oreos in (or on) something, it’s bound to be delicious. I am new to baking and was stumbled up on your post on these cute cupcakes. I had to try and make them and gave it a shot. Thank you for the great idea!! I just started a blog and will begin to start posting things as I bake and decorate them. ive made these, they were extremely cute and very simple. i found this exact recipe/idea in this adorable cupcake book with many other great ideas as well … i forget the name but i borrowed it from my mother and LOVE IT! im already planning on getting the book too.